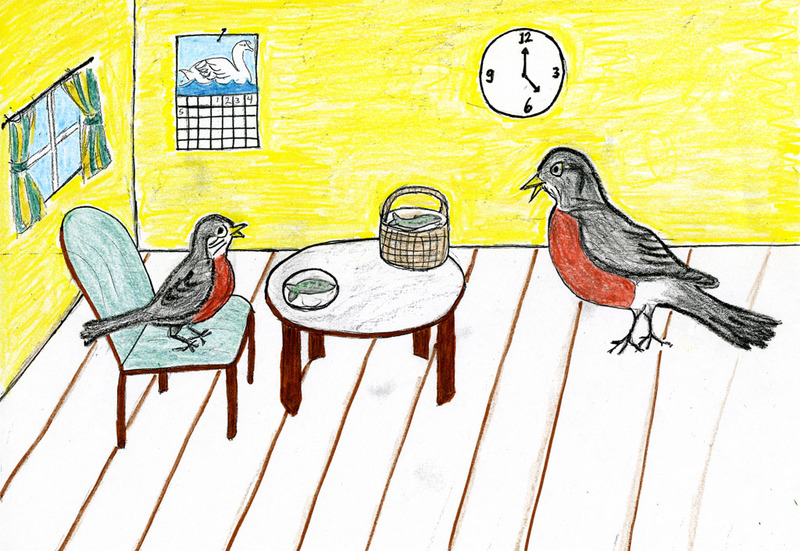 Note: These stories are here to be shared by lovers of children’s stories, but not to be published by others. The copyright belongs to Robby Robin’s Journey, aka Jane Fritz. 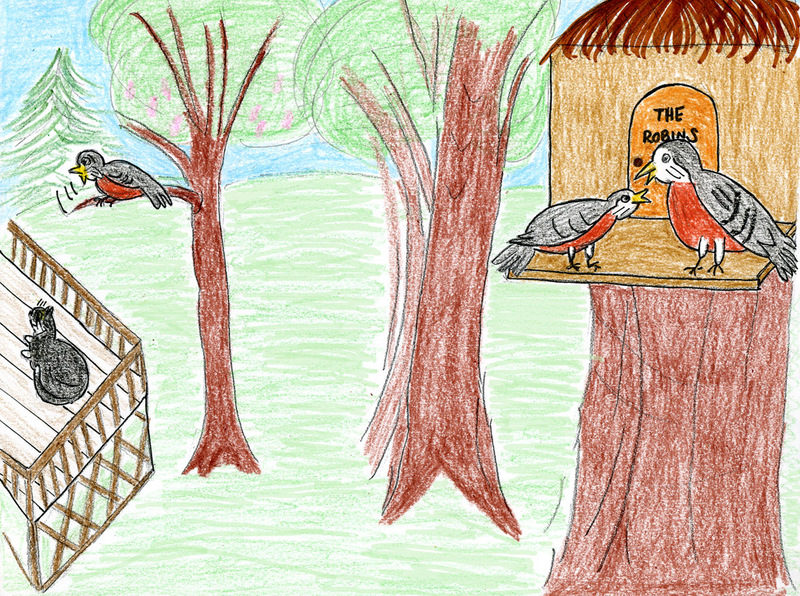 For permission to print or copy parts of any story, please contact Robby Robin’s Journey through a blog comment. 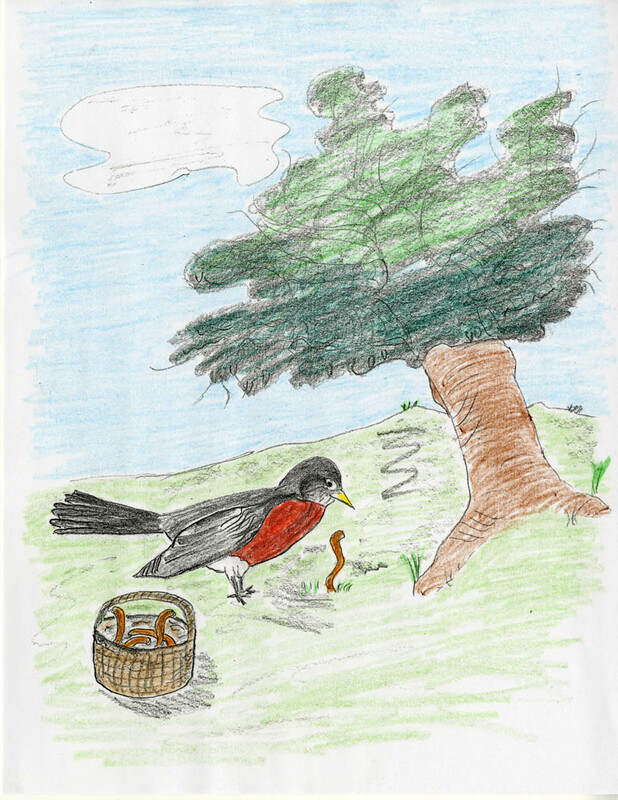 Mama Robin took her basket to gather some juicy worms for Robby’s supper. Mama Robin took her basket to find seeds. “Mrs. 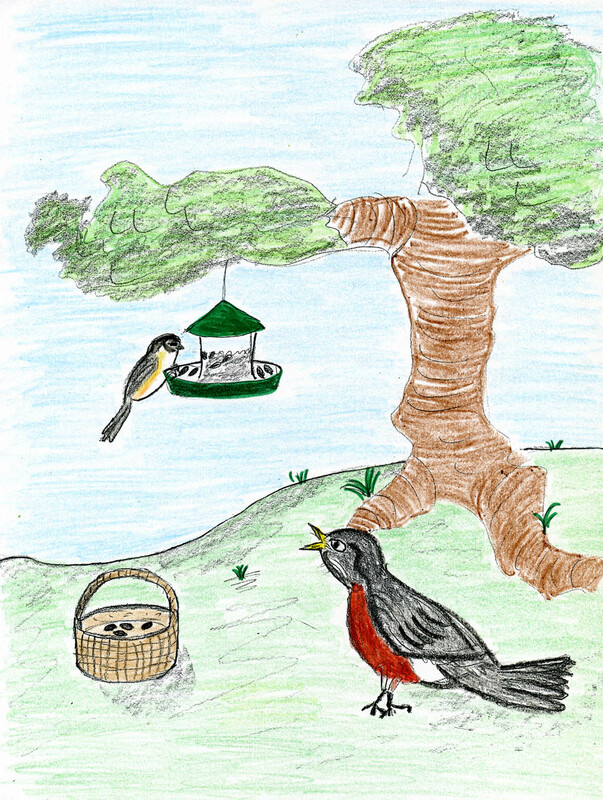 Chickadee, can you spare some seeds for Robby’s supper,” Mama Robin asked her friend as Mrs. Chickadee pecked for the choicest seeds in the feeder. Mama Robin took her basket to get some fish. “Mr. 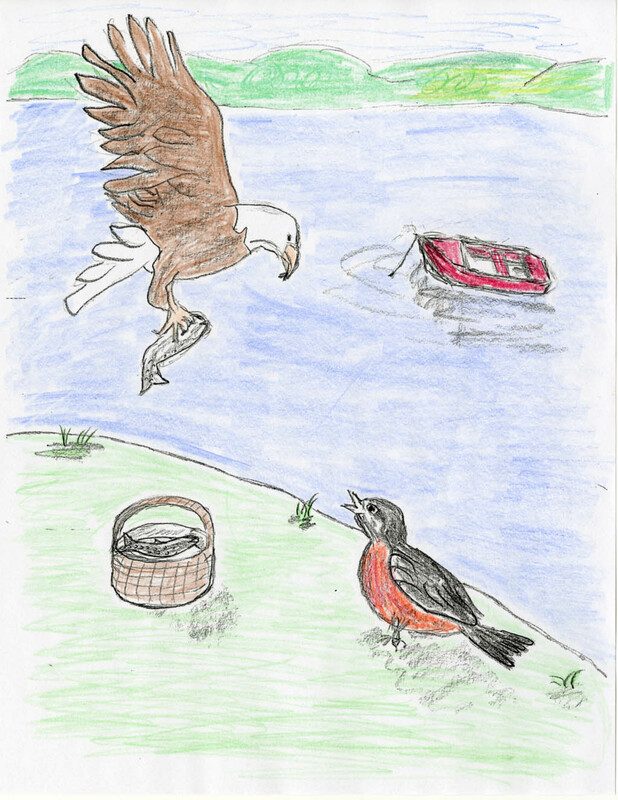 Eagle, can you spare some fish for Robby’s supper,” Mama Robin asked her friend as Mr. Eagle fished in the river nearby. wasn’t happy. “Blech. I don’t like this fish,” said Robby. “It smells funny and it’s hard to pick up with my beak. Mama Robin took her basket to get some bugs. “Mrs. 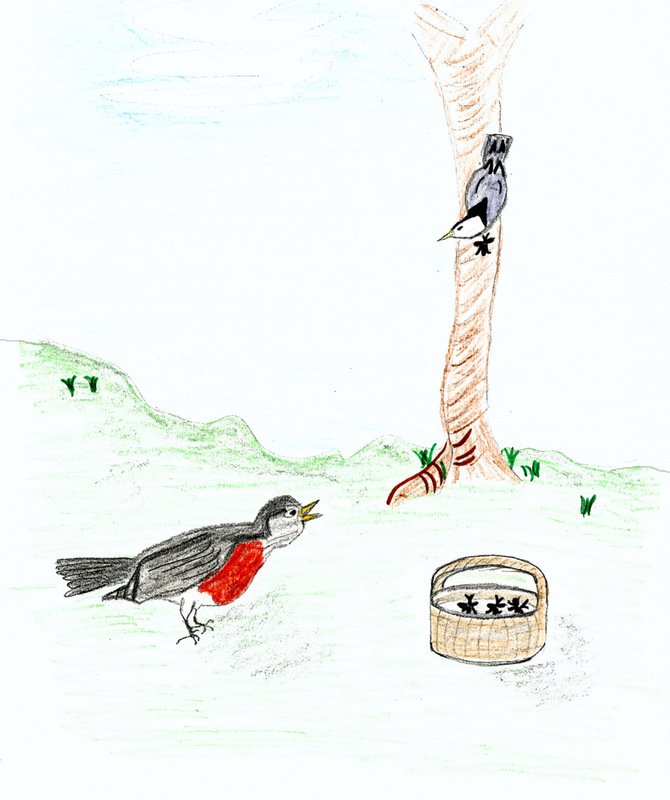 Nuthatch, can you spare some bugs for Robby’s supper,” Mama Robin asked her friend as Mrs. Nuthatch walked down a tree trunk carefully looking for bugs. wasn’t happy. “Yuck. I don’t like these bugs,” said Robby. “They’re too creepy. They fly away while I’m trying to eat them. I don’t want my worms, I don’t want seeds, I don’t want fish, and I don’t want bugs. Mama Robin took Robby’s sippy cup to get some nectar. “Mr. 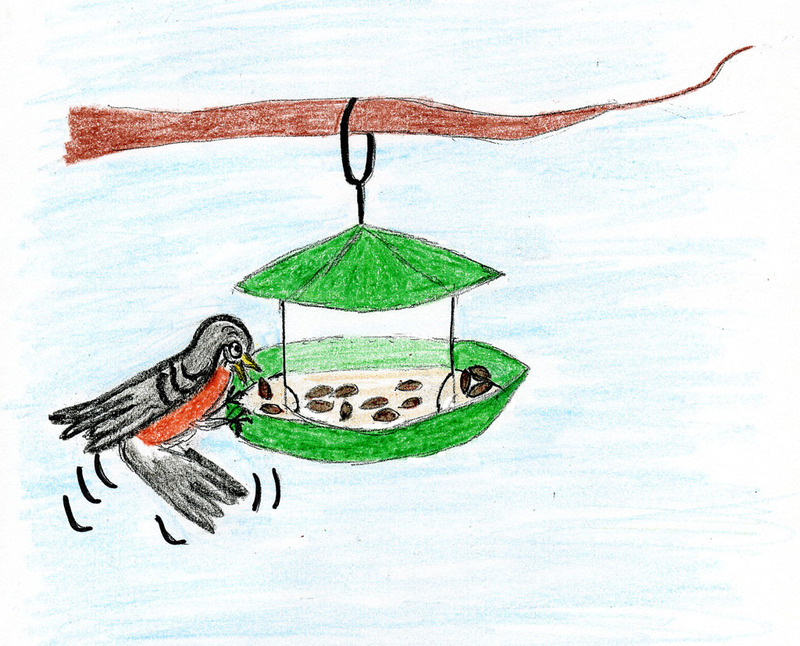 Hummingbird, can you spare some nectar for Robby’s supper,” Mama Robin asked her friend as Mr. Hummingbird sucked the fresh nectar from a popular hummingbird feeder. Mama Robin took her basket to get some fat. “Mr. 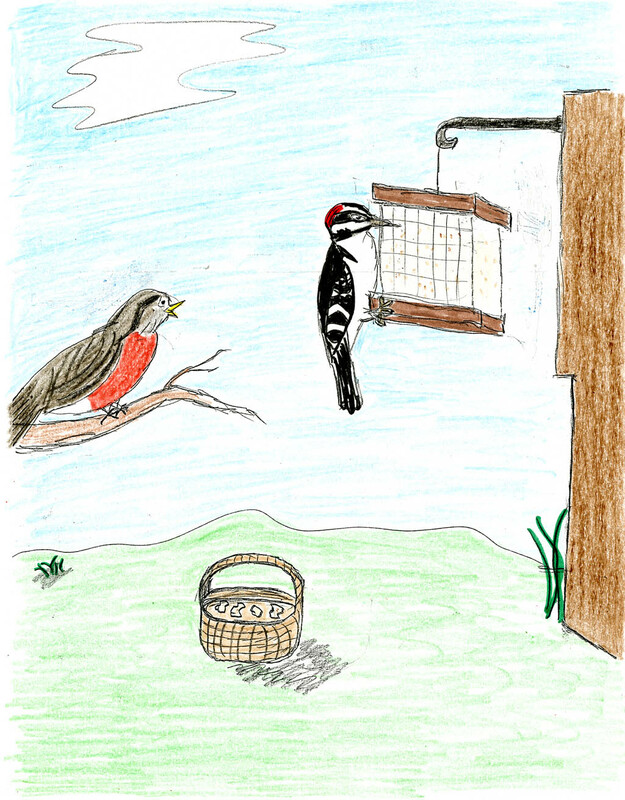 Woodpecker, can you spare some fat for Robby’s supper,” Mama Robin asked her friend as Mr. Woodpecker pecked for some juicy fat in the fat feeder. But when she returned with fat in her basket and put it in front of Robby, he wasn’t happy. “Waaa. I don’t like this fat,” said Robby. “It’s gross. It is too smooth and it has no taste. I don’t want my worms, I don’t want seeds, I don’t want fish, I don’t want bugs, I don’t want nectar, and I don’t want fat. Mama Robin took her basket to get some french fries. “Mrs. 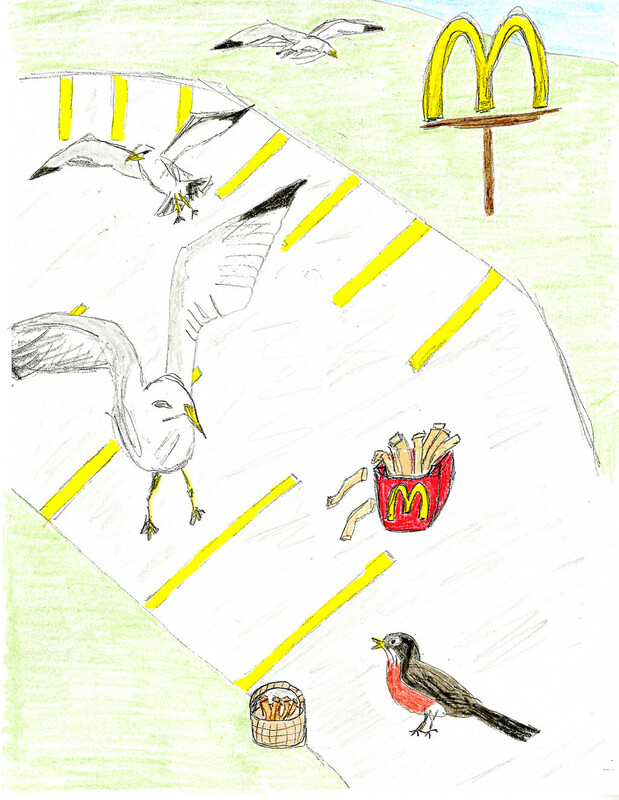 Seagull, can you spare some french fries for Robby’s supper,” Mama Robin asked her friend as Mrs. Seagull picked up another french fry dropped by a human outside a neighborhood fast food restaurant. Robby Robin thought about this. 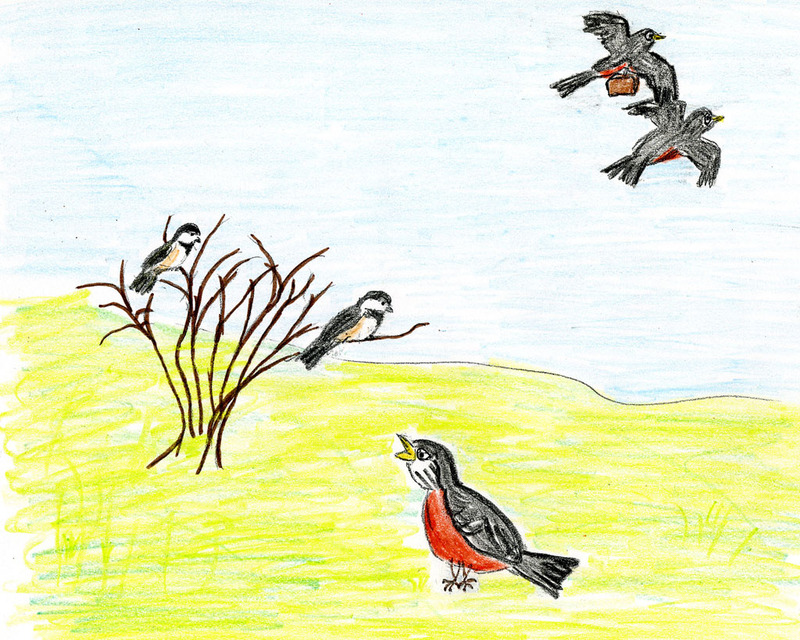 He didn’t want seeds, he didn’t want fish, he didn’t want bugs, he didn’t want nectar, and he didn’t want fat. French fries are OK, but they don’t wiggle and they are hard to get. He wanted worms! 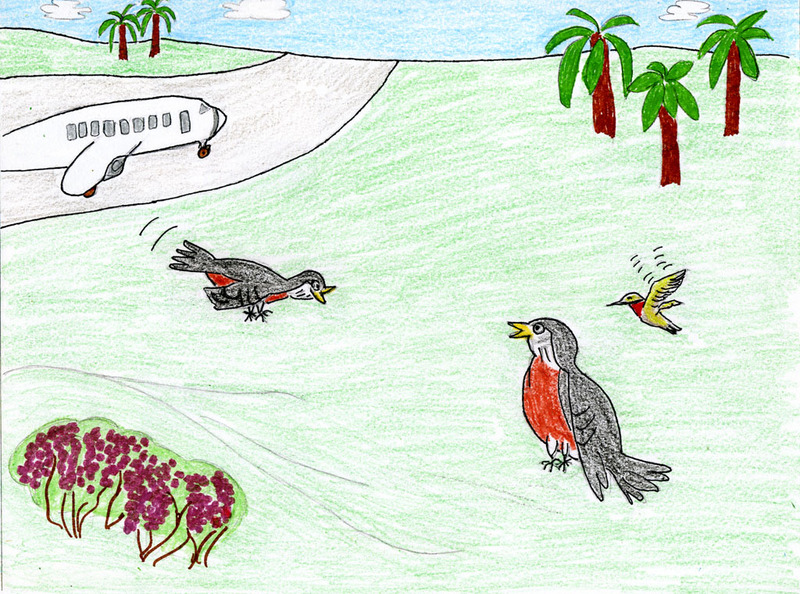 They’re wiggly, they’re squishy, and they’re easy to find whenever you want one – if you’re a robin. No wonder Grandma and Grandpa taught Mama about worms! They’re the perfect food for me. And Robby sat down and ate his supper. 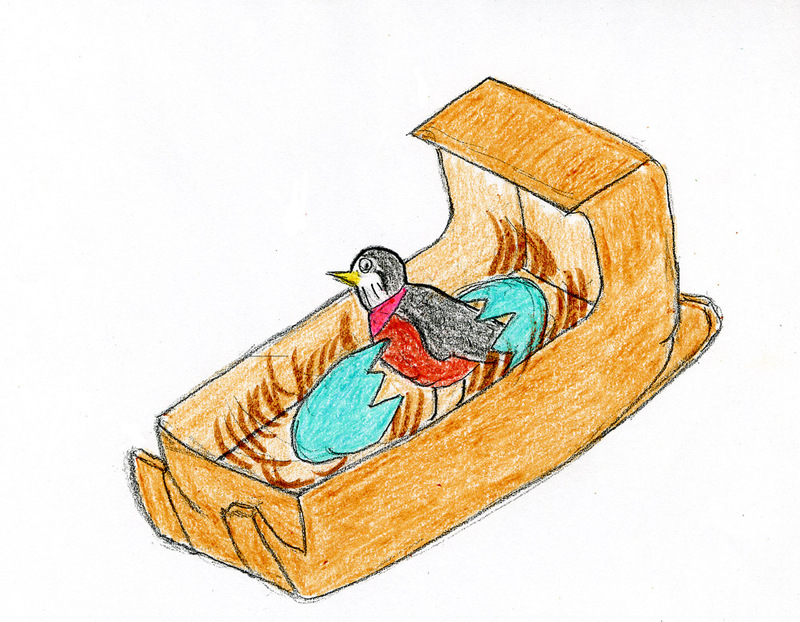 “He’s gone away with his family and can’t play with us anymore,” said Nelly Nuthatch. “Robby, that’s what happens when summer is over. 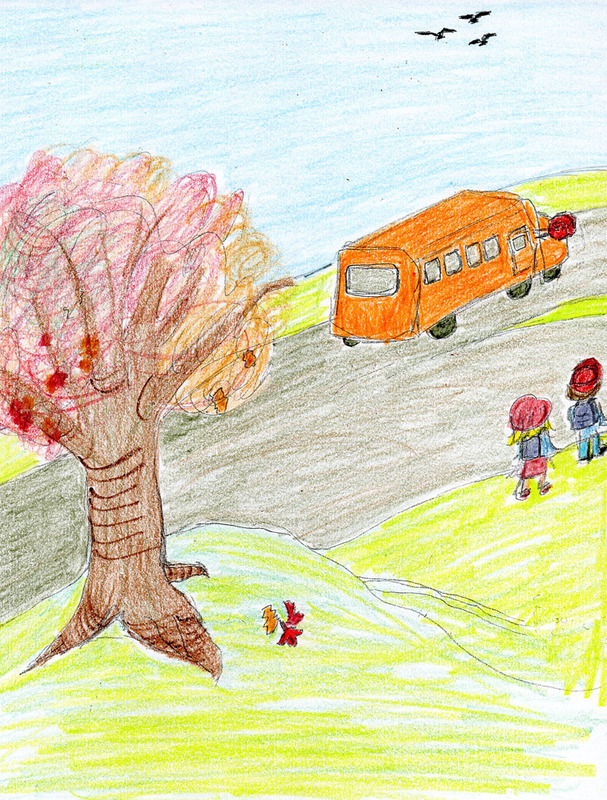 The children go back to school, the leaves turn beautiful colors, and birds like hummingbirds and robins fly away. We’ll be going soon and you’ll see Hubie in our new home.” explained his mother. “What’s winter?” asked Robby. “Winter is when it gets much colder outside,” answered his mother. 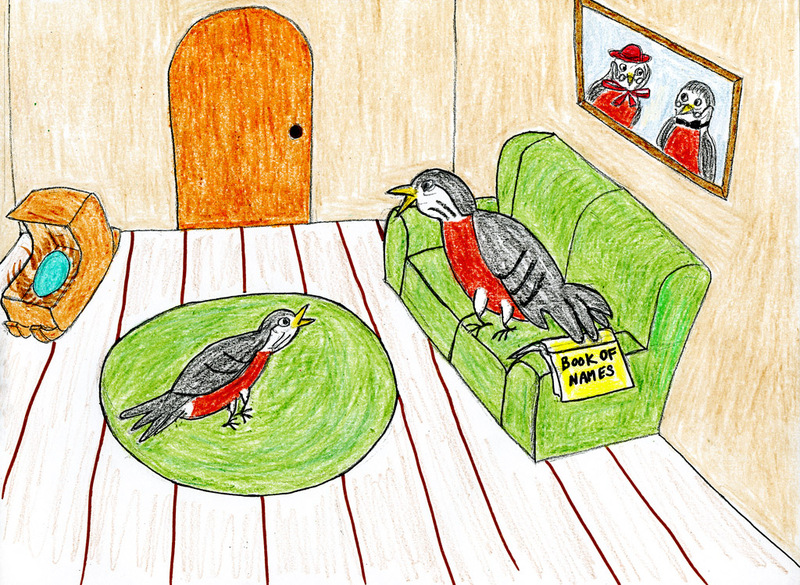 “I’ve heard about it from other birds. The flowers stop growing and the hummingbird feeders turn to ice, so hummingbirds can’t find nectar. 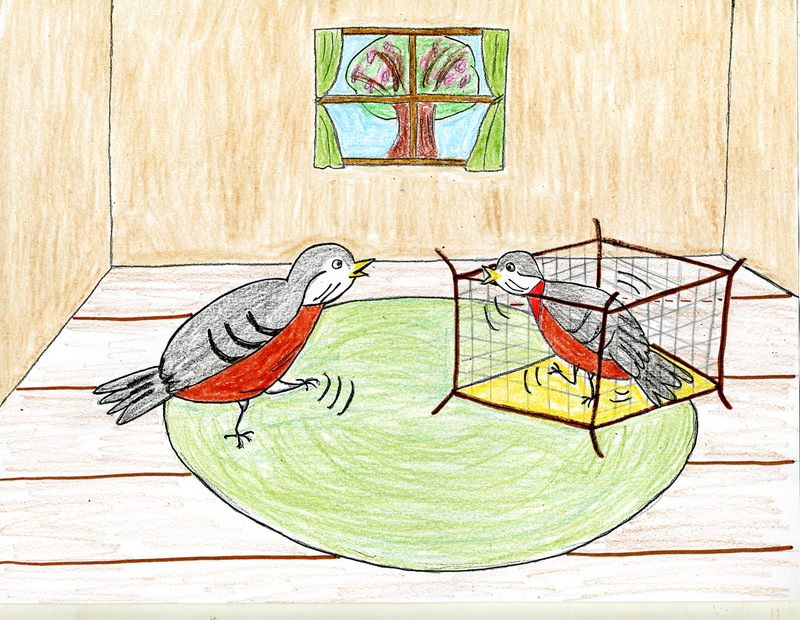 The ground becomes hard and covered with cold white rain called snow, so robins can’t find worms. 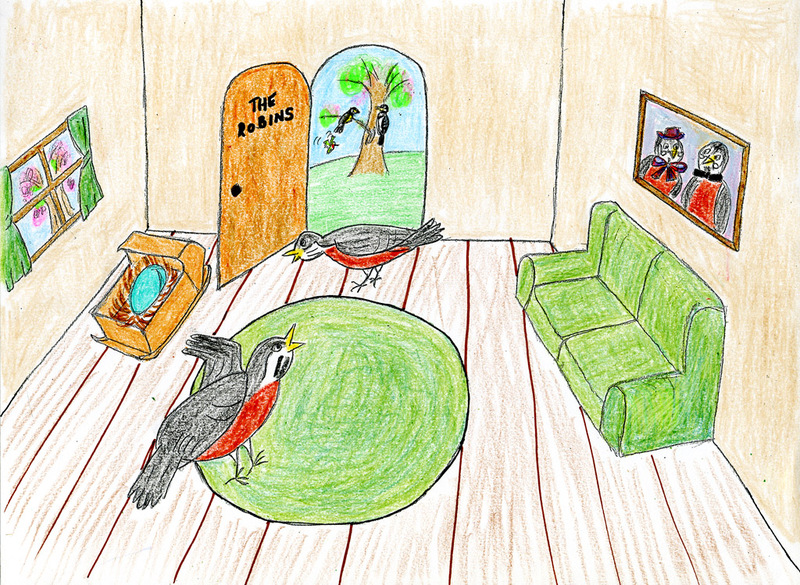 But Robby wouldn’t change his mind, so finally Mama and Daddy Robin reluctantly flew away and let him stay with Sarah Chickadee and her family. At first everything was fine. 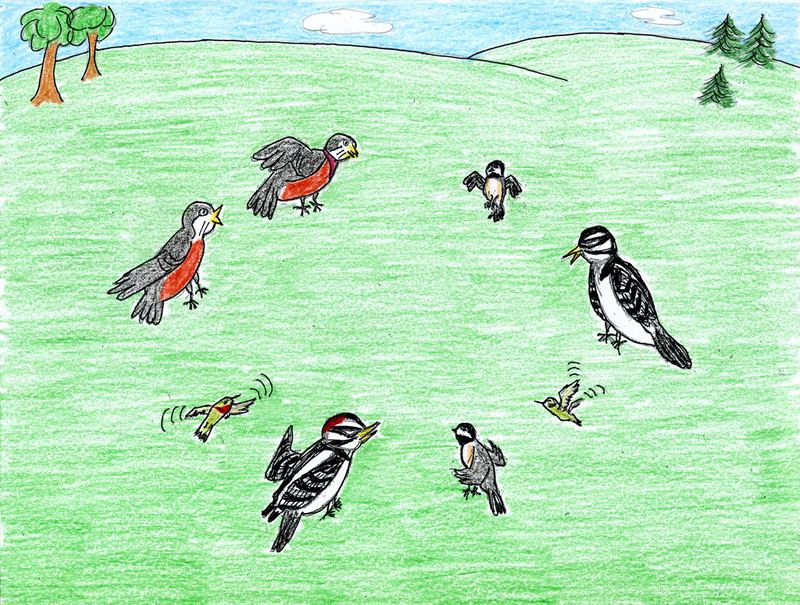 Robby had fun playing with Sarah Chickadee and his other friends. 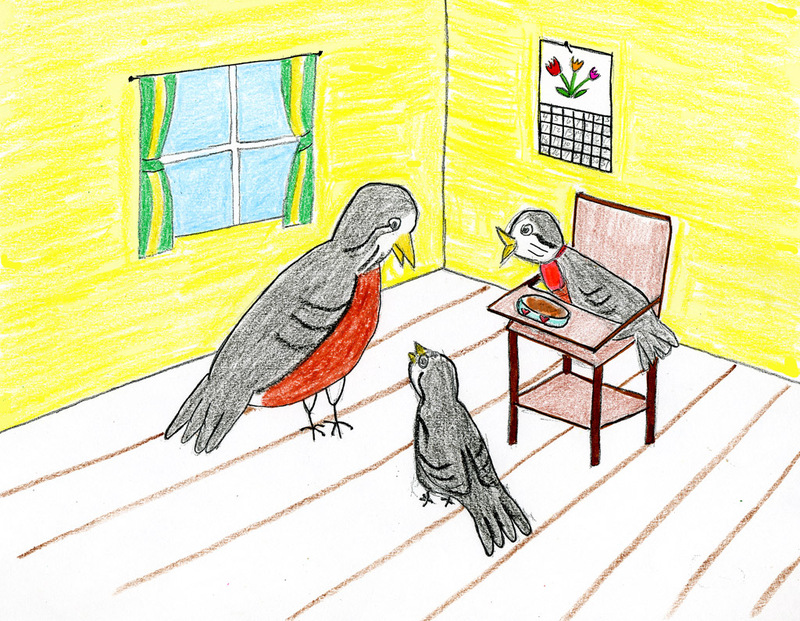 Robby practiced eating seeds for when the ground got too hard for finding worms. Then the snow came. It was very white and very beautiful. The children came out and built a snowman. The children had fun in the snow, but not Robby. He didn’t like to stand on the snow. It was cold and wet. 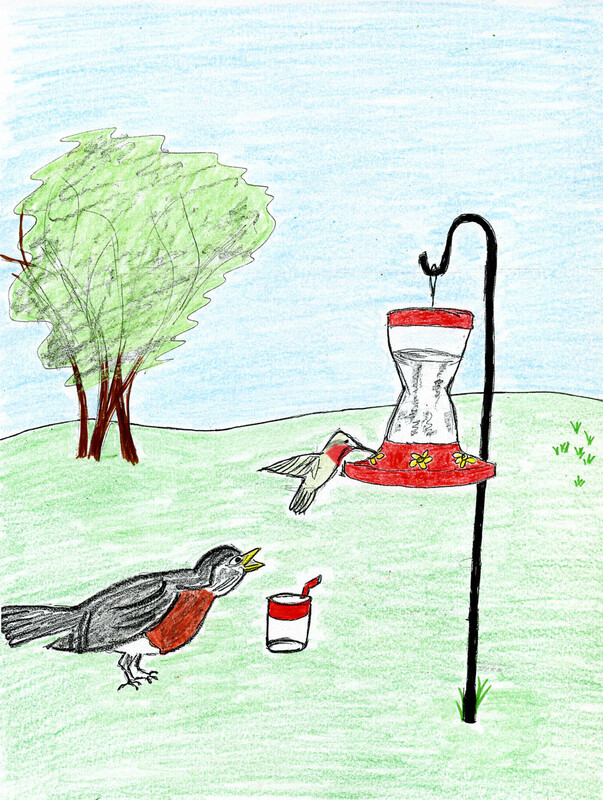 The feeder was hard to stand on and it only had seeds. Blech! He missed the squishy, wriggly worms. And then it became very, very cold. Brrrr!! 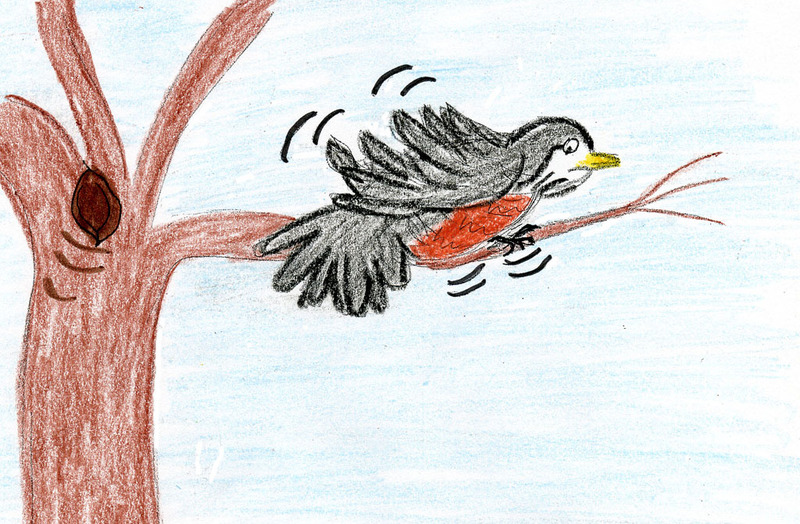 Robby shivered and fluffed out his feathers. This didn’t feel good at all!! 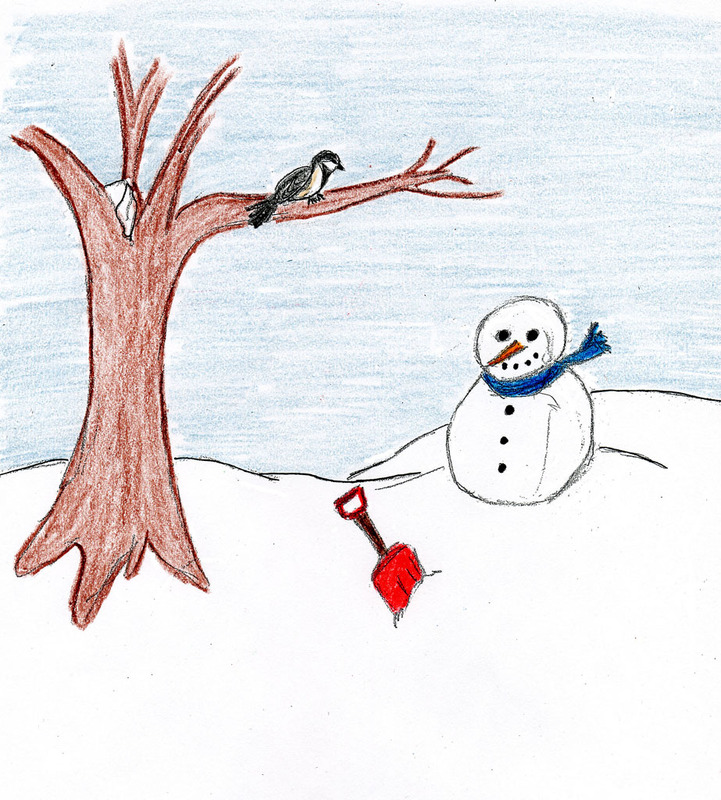 Sarah Chickadee liked winter. 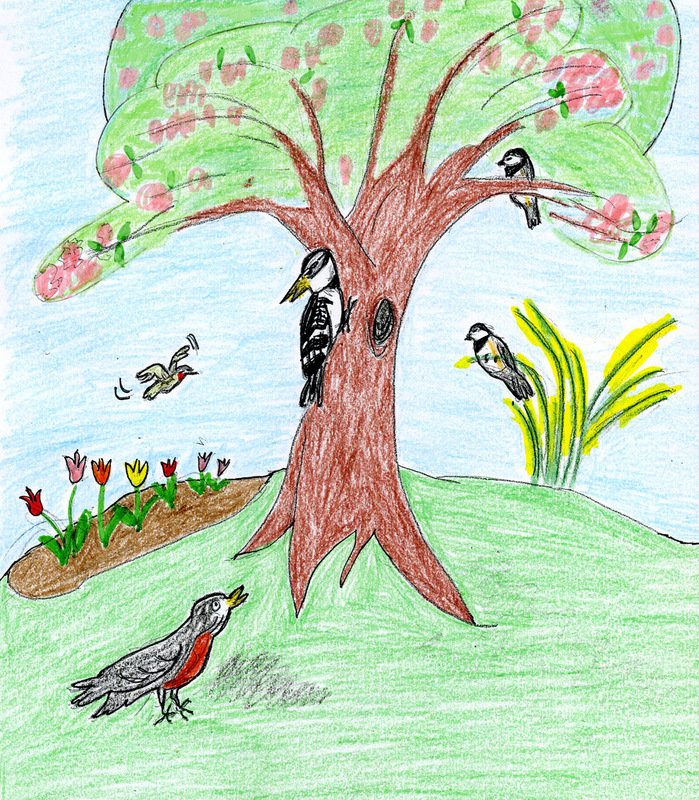 Nelly Nuthatch liked winter. 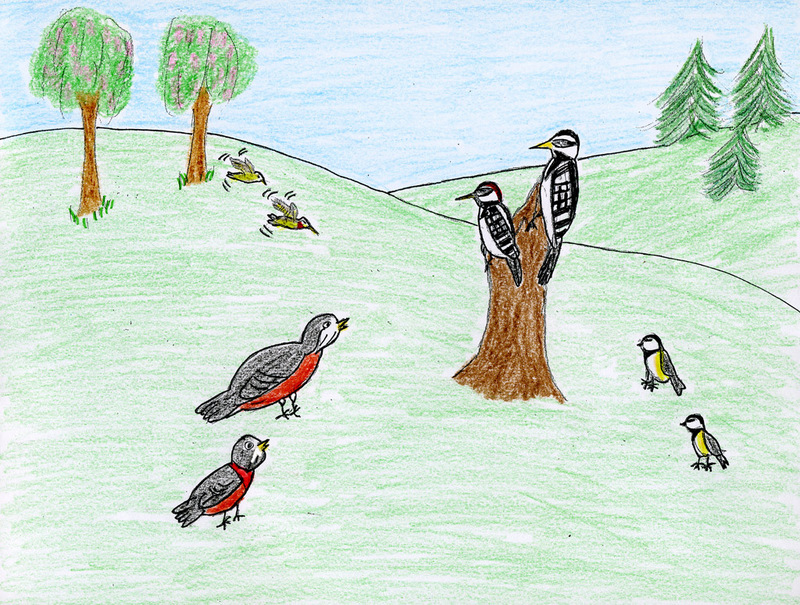 Wendy Woodpecker liked winter. They all liked their food. They all had their families. They all knew how to stay warm. But Robby Robin didn’t like winter. He was cold and hungry, and he missed his family. Sarah’s father knew that there was only one thing to do. Robby had to fly to Florida to join his family. 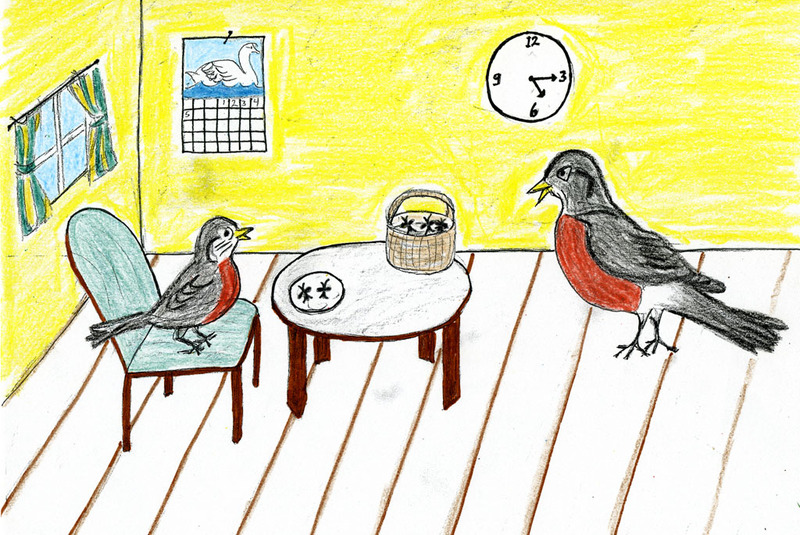 Mr. Chickadee explained to Robby that his family will bring him back when winter is over and summer returns. 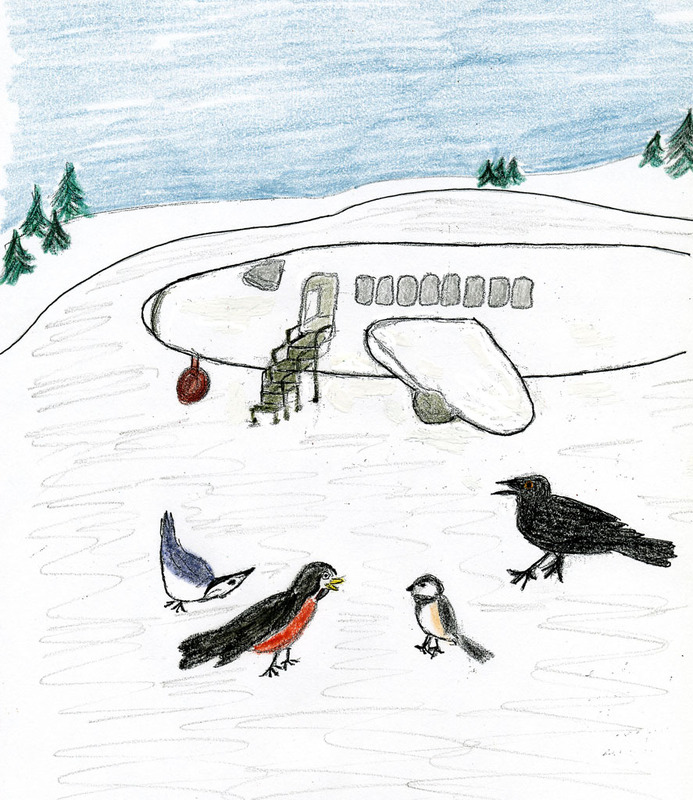 All of Robby’s friends gathered to wave good-bye as he started his flight away from winter, towards Florida and his family. When Robby arrived in Florida and saw his family waiting for him, he was so excited. “Mama, I saw winter. Mama, I saw a snowman. 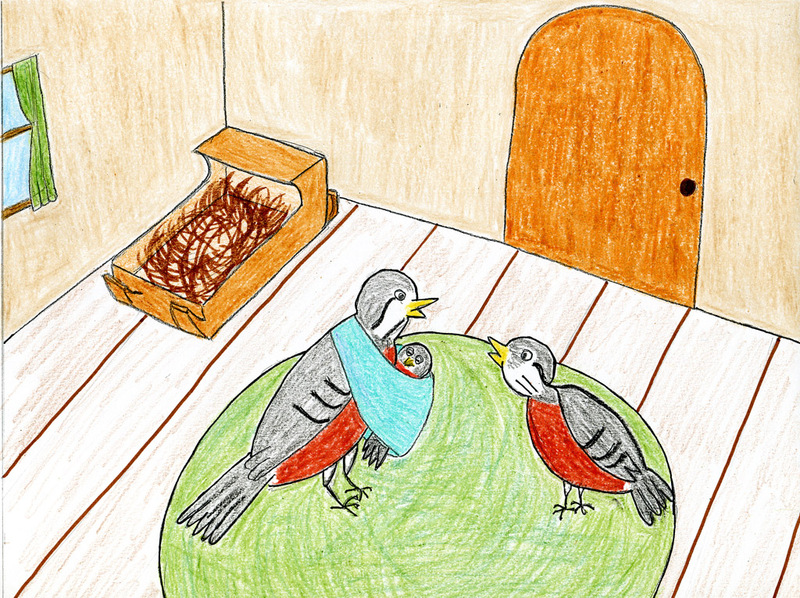 Mama, I ate seeds.” exclaimed Robby as he was happily reunited with his mother. Then he noticed that here in Florida it was summer. The grass was green. There were flowers. And there was Hubie! Now Robby knew that his mother had been right, just as Grandma and Grandpa had taught her. 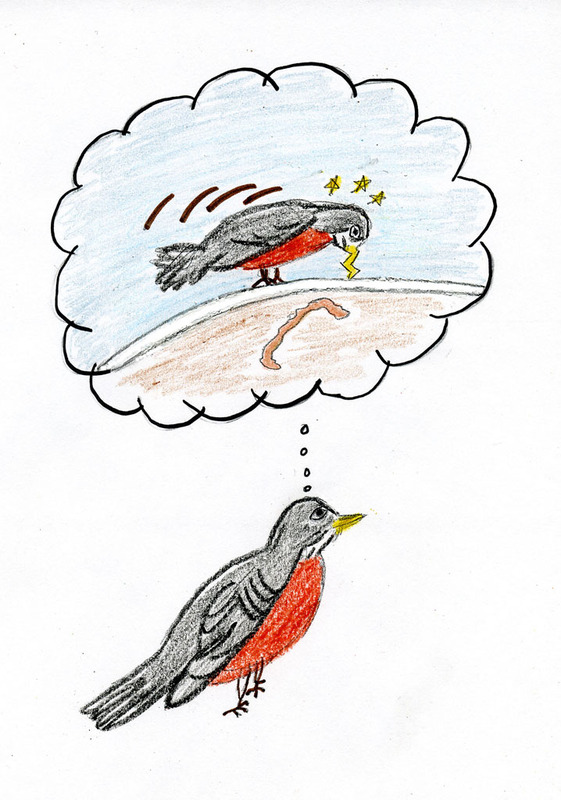 Robins don’t like winter. They like warm weather and worms, right here in Florida. No more winters for Robby! “I am? You mean we’re having a baby? Can I name him?” asked Robby. “First of all, it could be a girl, don’t forget. But, sure, you can help choose a name. Do you want to think about boys’ names first?” replied his mother. “Yes, I already know what I want. We should call him Santa,” exclaimed Robby with excitement. “No, I don’t want Tommy or Henry. How about Barney?” asked Robby. “No, I don’t want Milly or Ella. I want Rudy, even if it’s a girl,” replied Robby firmly. Robby went out to play with his friends. “My new sister, Holly, doesn’t know how to fly, so Mommy and Daddy have to teach her. 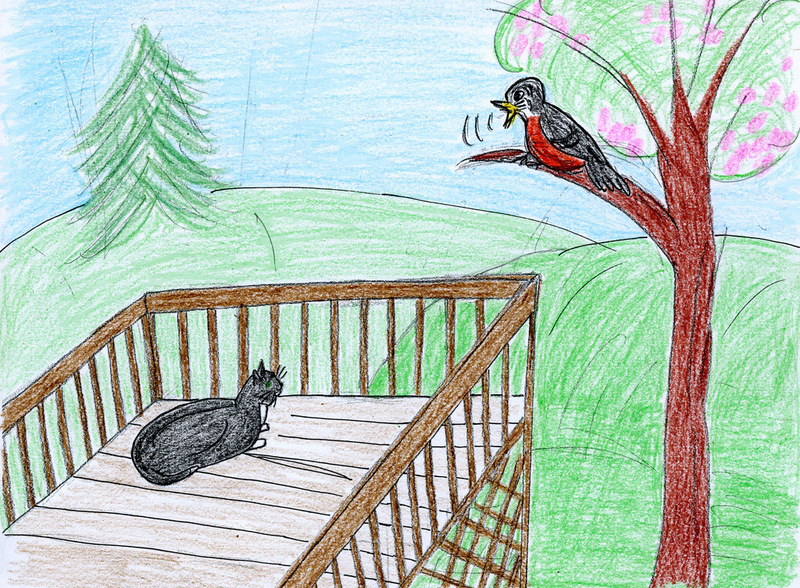 She’s too little to play,” said Hubie Hummingbird. Robby wondered what things would be like for him when Rudy arrived. Robby went back home to find out more. On his way he saw his father sitting in a tree making loud noises. “Mama, what’s Daddy doing outside?” he asked his mother. 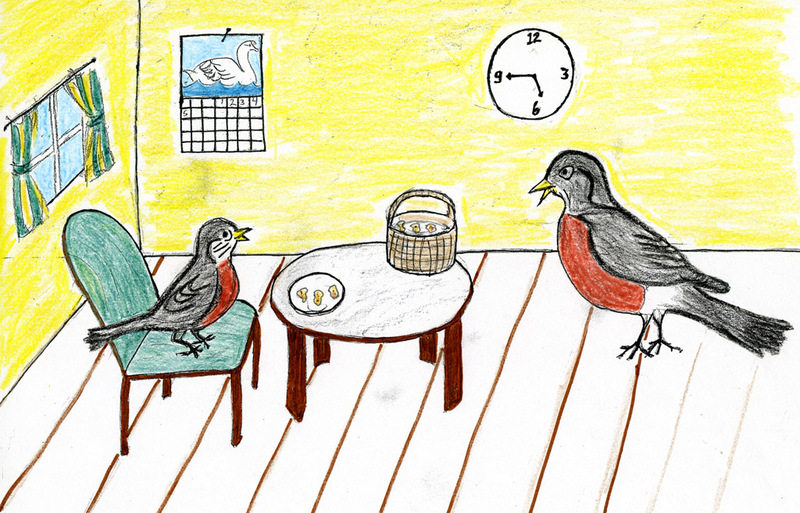 “He’s guarding our egg from our neighbour’s cat, Samantha, Robby,” his mother replied. 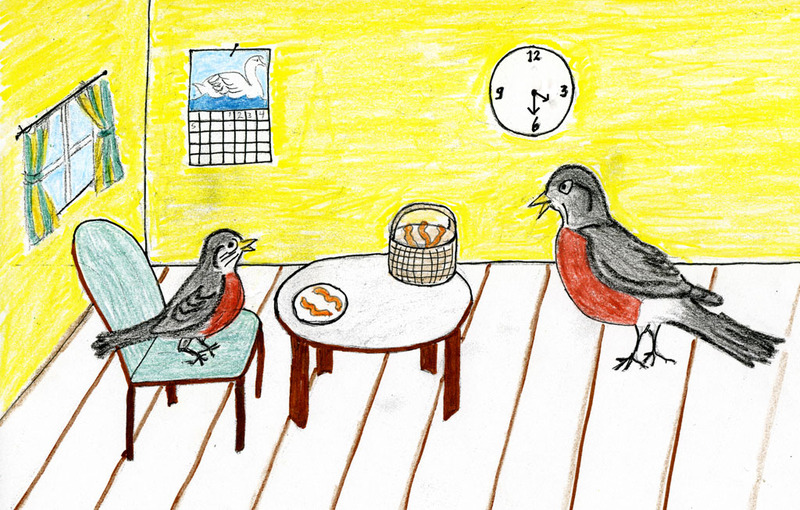 “Mama, my friends say that new babies can’t feed themselves, or fly, or even play. Can we get one who already can do everything?” asked Robby. 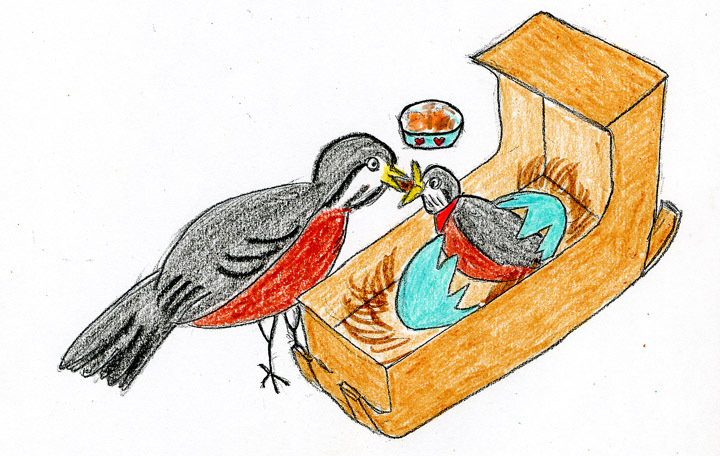 Before long the egg broke open and baby Rudy appeared. “Oh, Robby, look, Rudy is a girl. You have a little sister!” exclaimed his mother in excitement. Mama started feeding her right away with some mashed worms she had ready. “Mama, I’m going out to play now,” he announced. Robby could see that things were going to be different. The days went by and Rudy grew. She took a lot of Mama’s attention. Mama seemed to be feeding her and talking to her all the time. And Rudy still couldn’t do anything. “Mama, can Rudy play with me yet?” asked Robby every day. 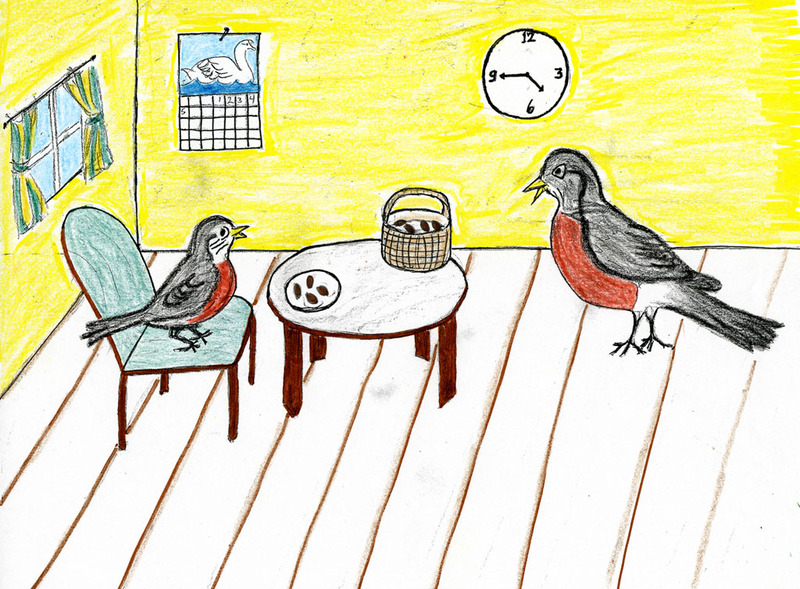 “Not yet, Robby, she needs to fly first,” was Mama’s standard reply. Sigh. 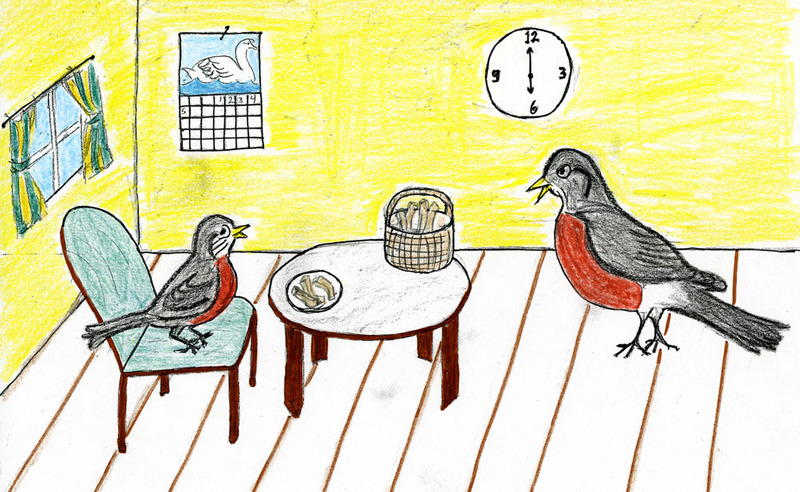 Robby wondered how someone who couldn’t do anything could take so much of his mother’s time. But he had to admit that she was very cute. More days went by and Mama and Daddy seemed to spend all their time mashing worms, feeding Rudy, and watching out for the cat. “Mama, can I go out and play?” asked Robby. “OK,” said Robby, who didn’t really think this is what he wanted to do at all. 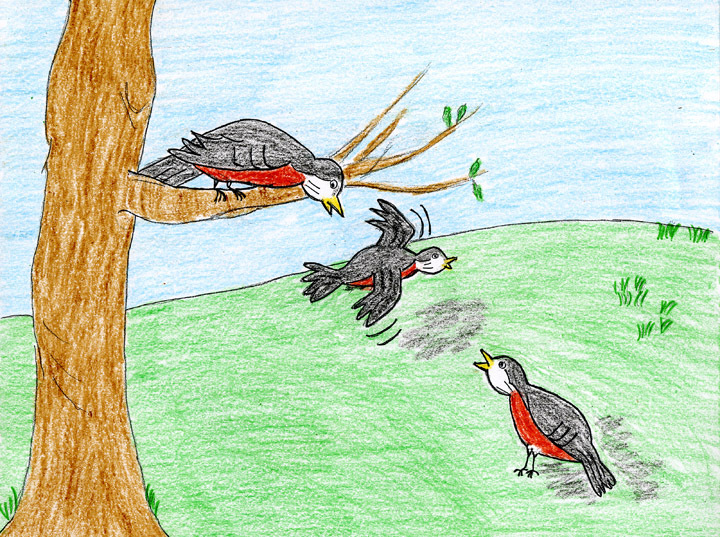 Mrs. Robin was not happy with Robby’s attitude and Robby was not happy with a new sister who couldn’t do anything and took all of his mother’s time. One day Robby noticed that Rudy was paying more attention to him. She seemed to like his songs. She liked it when he acted silly. She tried to do everything she saw him do. And then Robby noticed that Rudy was flapping her wings more. “Mama, Mama, I think Rudy wants to fly,” he reported. Robby nodded his head in excitement. “You go stand on the ground near the big tree next door. I’ll take Rudy with me and help her jump off the low branch. They practiced all day. Rudy loved flying with her big brother. Robby decided that having a little sister might be OK after all. He went to bed tired and happy. The next day Robby and his friends had planned to play hide-and-seek. He could tell his friends that Rudy could fly. “Mama, I’m going out to play now,” called Robby. Robby sighed. This wasn’t going to be perfect by any means. He and Rudy went out together. Robby wondered what his friends would think. When they found Robby’s friends, everyone had their little brothers and sisters with them! 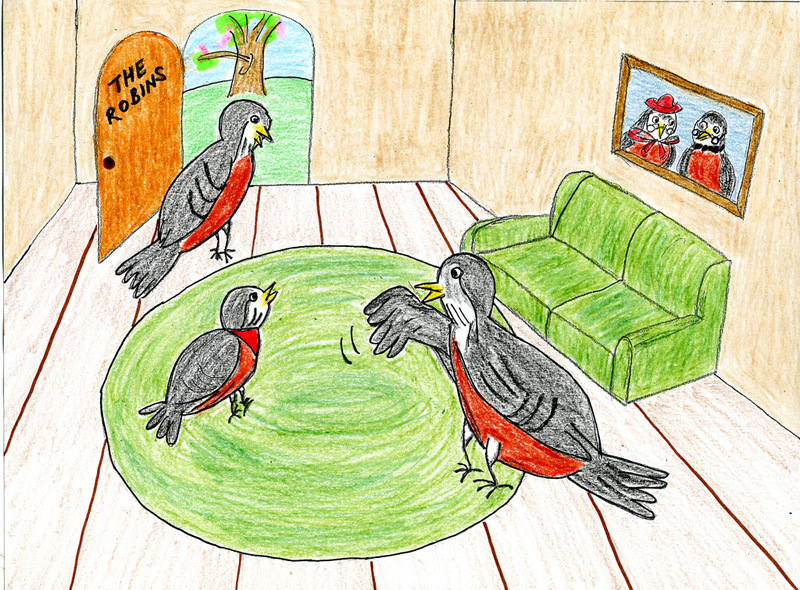 “My mother said that I had to bring Willy and that he is too little to play hide-and-seek,” said Wendy Woodpecker. 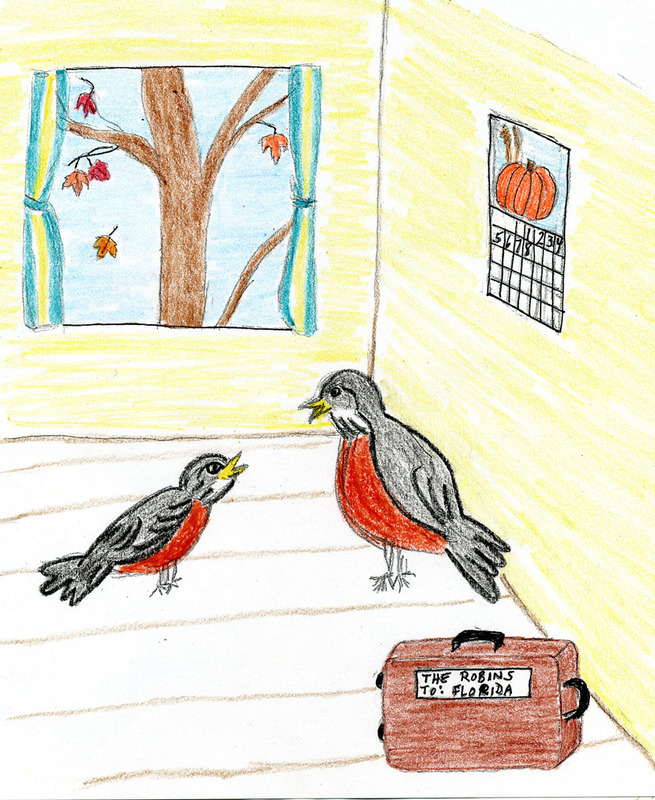 “My mother said that I had to bring Clara and that she is too little to play hide-and-seek too,” said Sarah Chickadee. 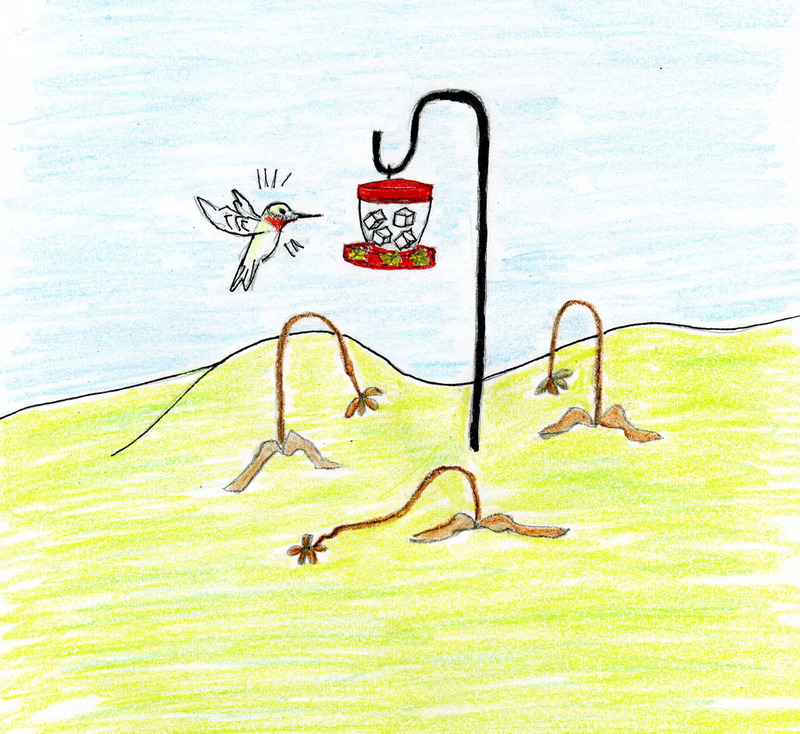 “My mother said that I had to bring Holly and that she is too little to play hide-and-seek,” said Hubie Hummingbird. They all wondered what to do. So that’s what they did. Everyone had a great time, and everyone went home tired and happy. Robby learned that playing with little sisters and brothers isn’t bad at all. And that being a big brother can be fun. Thanks, JoHanna. And thanks for stopping by! 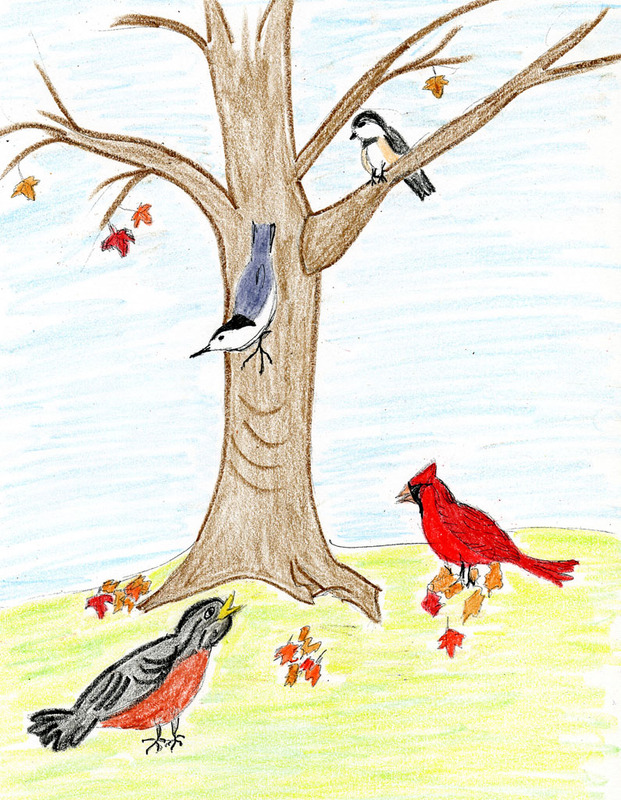 Pingback: Carnival of Children’s Literature – March 2012 | Just Children's Books!